If there was anything in 2005 to Michael Schumacher, it was seeing his rivals go past him and disappear into the distance. To be frank, he gave his best, but his machine wasn’t up to the mark and ultimately it made him look like a miser in spite of his royal stature as a world champion. Following my idol since many years, i was not ready to accept this sudden change in fortunes but like all legends, he just took it by his stride. It was his worst year or to say was going to be his worst in his illustrious career. One can’t rest on past laurels. One needs to strive hard to maintain. Its easy to lose, like we saw in 2005 season. It was not that he fell for the occasion, his opponents rose to the occasion. It was for me, this time around i did lose my focus because of some goof up in my academics. I was confident though, but sometimes, results mattered more than confidence. You don’t win just by having confidence. Having confidence is like a consolation to the people who didn’t quite make it. I managed to clear, thanks to my self-belief, but my idol couldn’t. He was helpless. One thing, i learnt from this guy was, He didn’t complain when things were going wrong for him, instead he was keen on improving himself and hoping things could turn this way. Unfortunately, it didn’t. To be frank, his attitude helped me a great deal. I was just being quiet, not reacting to what happened, instead concentrated on what i had, trust me, this was the beginning for me. I just went about my business and i started enjoying this new phase of my life. I started accepting things which came my way without doubting some of the decisions. If i wasn’t clear, i made sure i got answers to it. I had failed, and first thing i did was to accept this fact. I didn’t lie to myself, it was tough comforting myself initially. I turned to this guy and i was convinced to go his way. He had failed as well and he was the first person to acknowledge this fact. Towards the end of the season, it didn’t change for my champion. But things changed, for the better and it was for me not for him. The attitude with which he took this disappointment was something which i wanted to imbibe. He knew he was the champion, just because he failed, it didn’t tarnish his self-confidence. He had enough time to recollect his past deeds and be contend with what he had. At the same time, if given an opportunity, he would be the first to seize it. My life changed or to say started to evolve in a different way than previous to it. I didn’t know whether it was right way or not, but i was enjoying this process of evolution within me. The year ended, with a hope to win his 8th title and for me, i was just hoping, i shall continue enjoying this new found path. 2006 looked promising, i , like Michael, believed in going out there and do my best. It was a forgotten story to most of them, but for me, it was it was the first stop. First Pit-stop to put it in a better way on my road to success. The Greatest Driver. Senna’s Shadow. He’s been accorded the highest of praises at the same time been villified by the rest. But to me he was the guy who gave and tried his best. People only tend to look at his preformances post 2000, forgetting that perhaps he was even better when competing against the likes of Hakkinen, Hill, Villeneuve. Those were the heady days of F1 when a driver’s talent mattered more than a car’s performance. I like schumi not because he drove ferrari but because he gave us a reason to view and experience the sport the way it should be: ruthless yet sportive. I agree he was no saint. Neither was he the devil. Like i said he gave what he thought was his best. So “Whats michael gotta give” ? He did give his best. We need to do the same. Try not to worry about the end result. Good results always follow sincere efforts. But one might argue if you are not playing to win then why play at all. Well .. if you don’t try your best you are definitely not going to. You might sometimes, but not always. Ah! 🙂 Could relate to this very ,very well. 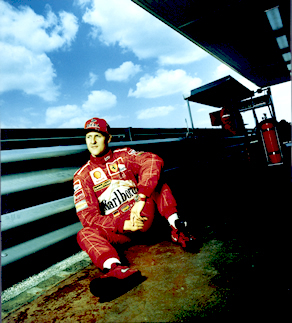 Schumi has affected me throughout my life. Even with academics, yes. You've put it down very well. I don't think anyone else could survive a season like 2005 and still come out shining bright. He's incredible.He's the best.I can't say more.